The man stood up among the crowd in an improvised podium. His words were loud, and the expectation could be felt in the air. "Ladies and gentelman, boys and girls, brothers and sisters! The Season of the Hun has started. Monstes from all across the world are gathering around our cities. This will be your best chance to kill a titanic wyvern or even take down one of the legendary Elder Dragons! Grab your weapons, because its the time. As always: The bigger they are, the better you get paid! Go claim your prize!" The man continued talking like a preacher, surrounded by almost all the city. Rixos was the first to leave. He got out from the crowd and nodded to himself. "Yes, this might be the plane I was looking for." He wandered all across the city with the only compnay of his thoughts. Finally, he crossed the gates. 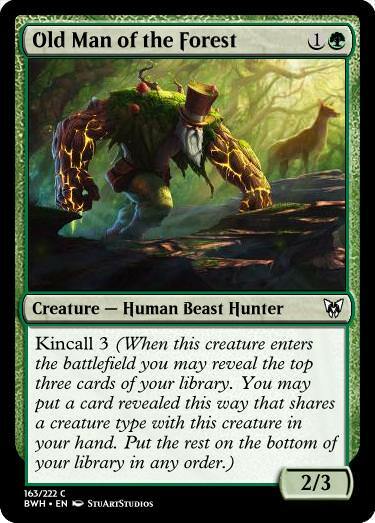 Out in the wilds, the Hunt was waiting for him. I saw people do this so let's go! 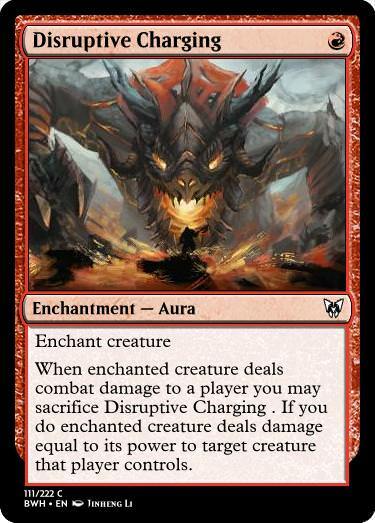 1- A counterspell in red. 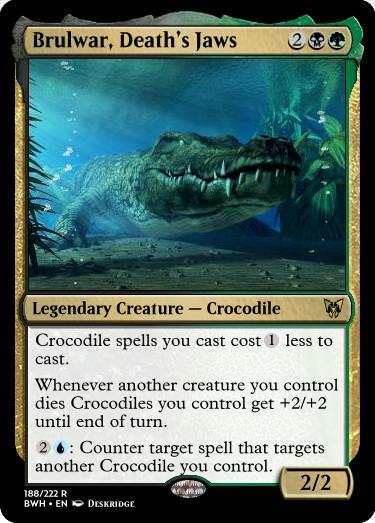 2- A card that can create lots of copies of the strongest, deadliest and scariest creature ever printed in magic. 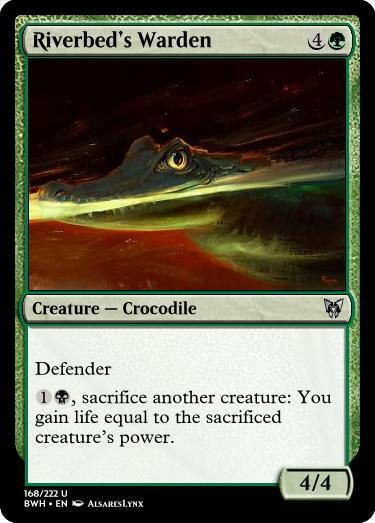 3- A card that can create lots of copies of the strongest, deadliest and scariest creature ever printed in magic. 4- Too much card draw for white. 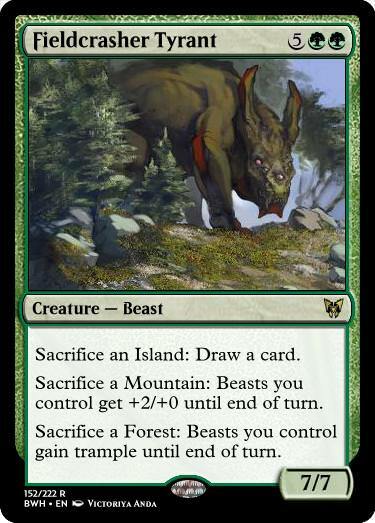 5- A legendary creature for a tribe wich has no legendary creatures (Expect this for each of my sets). 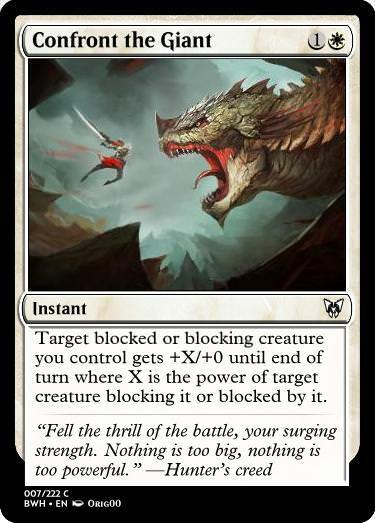 Balix is like a faction set: Hunters vs Monsters. 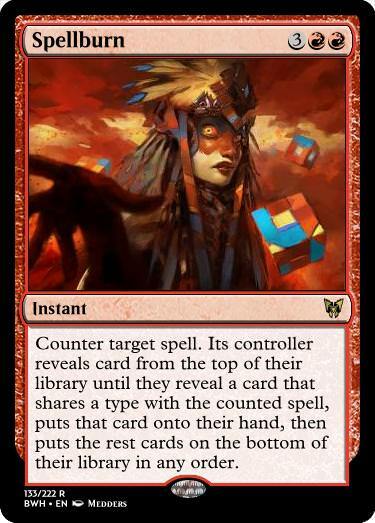 Every "faction" is spread among all five colors. 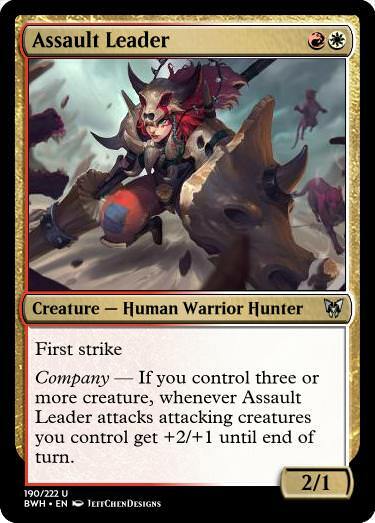 Company is a pseudo that belongs mostly to Hunters. 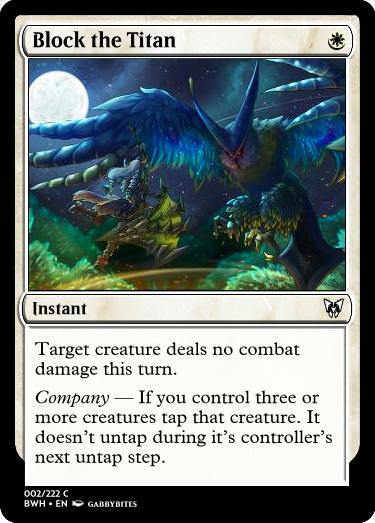 It reads like this: "Company — If you control three or more creatures [effect]." 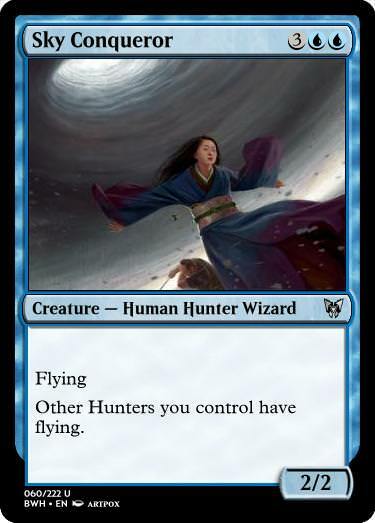 It intends to give Hunters an "go wide" feeling. 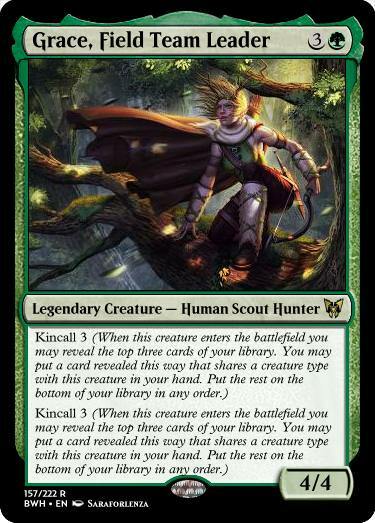 Kincall is the second Hunters mechanic. It shows mostly in white and green. 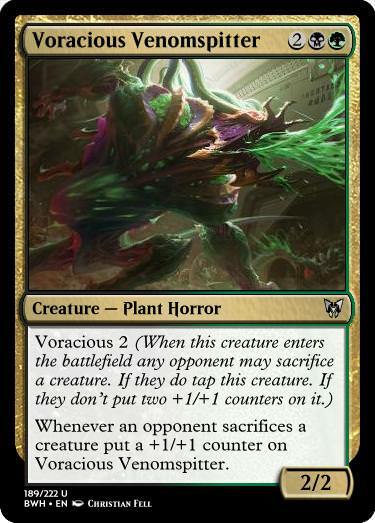 The main Monsters mechanic is a tweak on Devour. 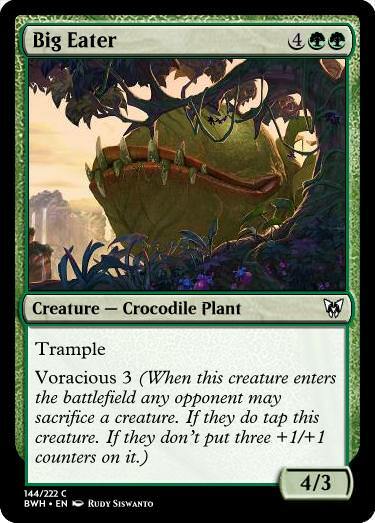 Note: A crearture may have multiple instances of Voracious. Each of them triggers separately. This is the last mechanic. 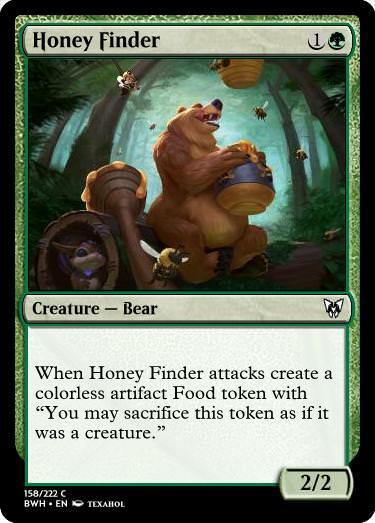 Food tokens are artifacts that can be sacrificed as if they where creatures. 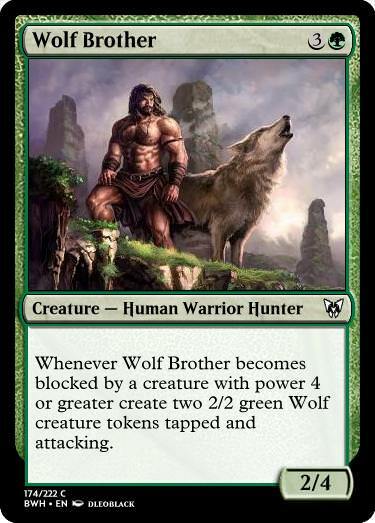 Monsters and Hunters make food tokens. And that's it. Tell me what do you think about them. 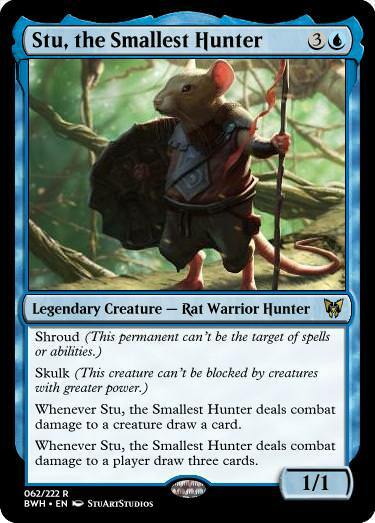 Last but not least: Monster Hunter references! I take it #2 and #3 are the same prompt on purpose? 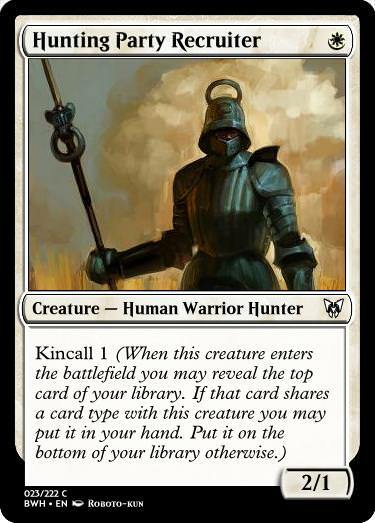 Kincall seems like a decent way to generate card advantage in WG's relevant card type (creatures) without letting White 'draw' too freely. 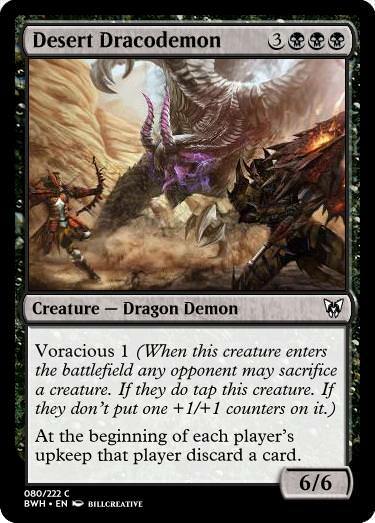 Voracious is essentially tribute where the alternative option is always "sacrifice a creature to tap for one turn". 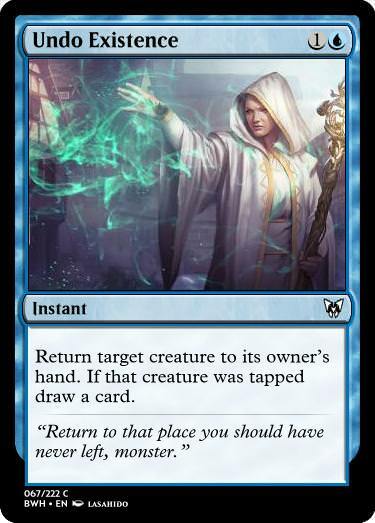 Not sure how I feel about it in a vacuum yet but I'm interested in seeing more cards featuring it. 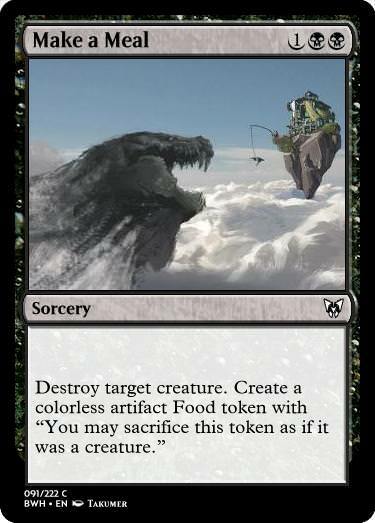 I'm especially skeptical about the ability to just deal with it by using Food tokens instead as I feel like that removes a lot of the 'bite' it potentially has as a mechanic. 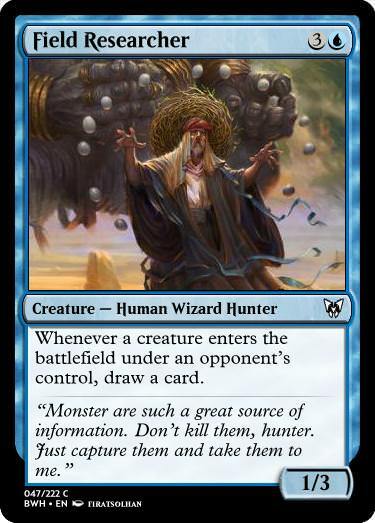 I'm actually kind of surprised I can't remember a Monster Hunter themed set on MSE before. Looking forward to it. Rixos Ker ran through the forest, almost breathless. Behind him he could still hear the footsteps. -You thought you were the most inteligent, didn't you Rixos? Te best way to make yourself knowm? Of course hunting the biggest thing you could see was a good idea. -Said to himself. Rixos snapped out of his refuge and stood in front of the titan. -Come to me!!! I'm ready! The dinosaur looked at him and catched breath. Then, he opened his mouth and released a giant blaze. Rixos was ready. With a snap of his fingers the air broke in front of him. The fire dissapeared inside of it, and, as suddenly as it had opened, it closed. 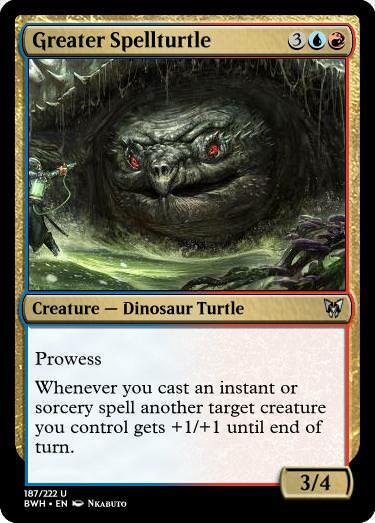 The dinosaur stopped right where he was, with a surprised look. Then, Rixos opened his hand and a new breach appeared after the dinosaur. The fire broke out burning the scales of its own maker. 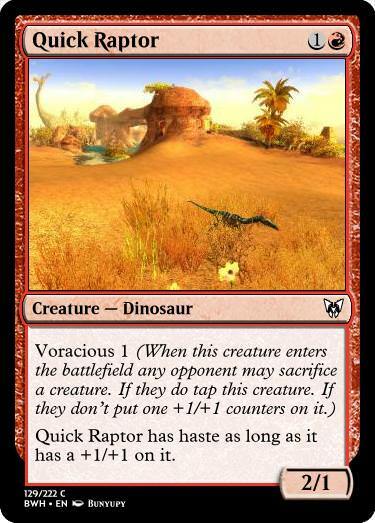 The dinosaur roared in pain and ran away. The man was sitting in his armchair, with all his attention in his wine, when somebody slammed the door. He looked there, whitout much interest. Rixos threw a colossal head at him. Surprised, the mas jumped from his seat. The wineglass fell to the floor. -I've killed it. -Said Rixos. - Now it's time that you fulfill your part of the deal. The man nodded, yet shocked. -You... what the hell are you? -Just a man whit a goal. 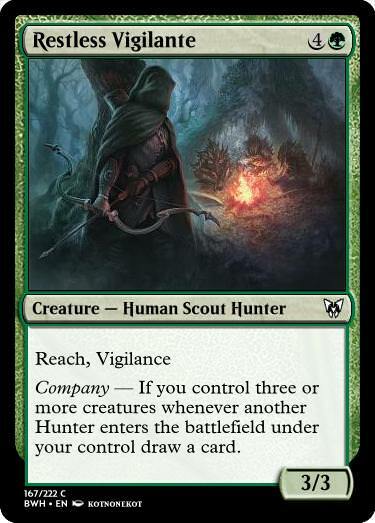 -I've been told that you are searching for the best hunters in the area. -Not only hunters -answered Rixos. -Well, I'm the best Hunter you will ever find, regardless of what Grace says. You can call me Doer. 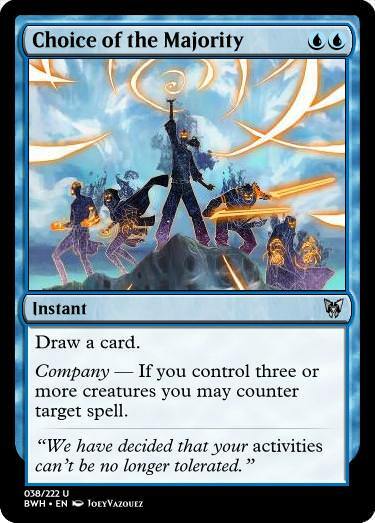 I will gather your team. Trust me, I know exactly what you are looking for. -The cat smiled at him and jumped on the table. -But first of all, I want to eat. Cousin! Bat and Cat are actual types, fwiw. 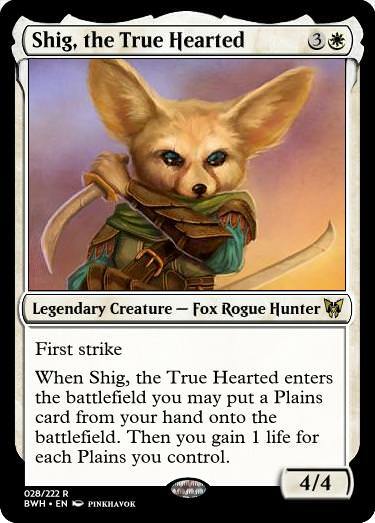 Shig was scouting the desert, as she did every day. 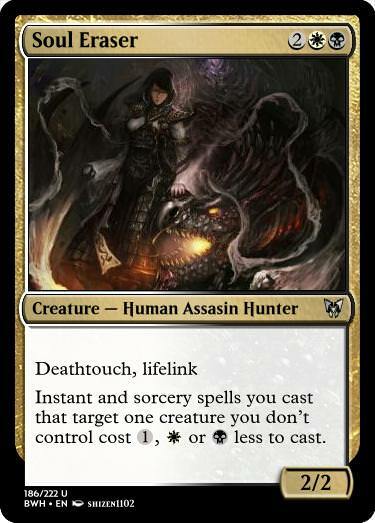 For her hunting was not a game but a necesity for survival. She saw a movement in the sands, and two small purple horns emerged from it. Shig jumped off the cliff she was standing on and started following the beast. She drew her daggers and jumped to the nearest stone wall. She ran on it, almost without catching breath, until the monster jumped out of the ground, whit his open jaws under the feet of a small deer. She threw herself down just on the back of the monster and started stabbing it. It roared in pain and started shanking, whit obvious intention of throwing her off. Dagger after dagger Shig mantained the position. The monster ran away form the area and Shig jumped. She sat down on a rock, watching the beast go away. Another day with safety for her village. Stu walked quietly through the small breach on the rock. In front of himk, he could see the shining wings of the baby dragon. With spear in hand he approached his new prey. 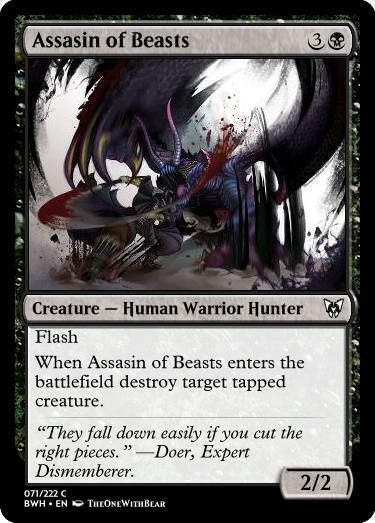 Well, not his prey, just his new victim. Well, not his vicitim, his new... Stu didn't knew how to call it. 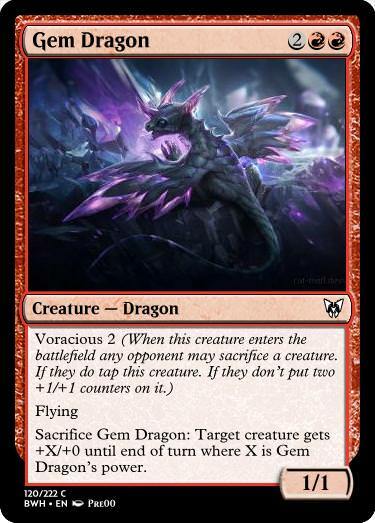 He just wanted one of its gems. But he coundint get that idea out of hid head. What was his connection with the small dragon? As always, he found himself meditating about life. He shook his head and continued walking. When he reached the dragon, as quiet as he always was, he threw his spear. It bounced in the dragons gems, and the small beast, flied away in panic. Stu was dissapointed. He couldn't return without his prize! 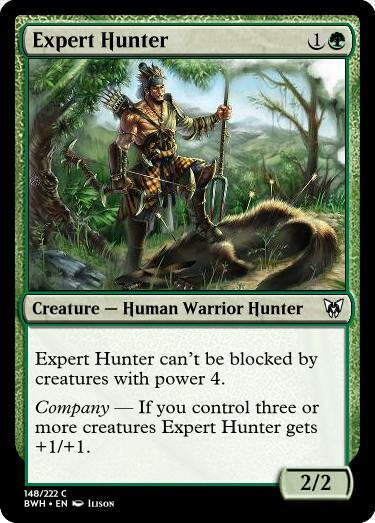 He needed to improve his abilities if he wanted to be the best hunter ever. The cat was angry. 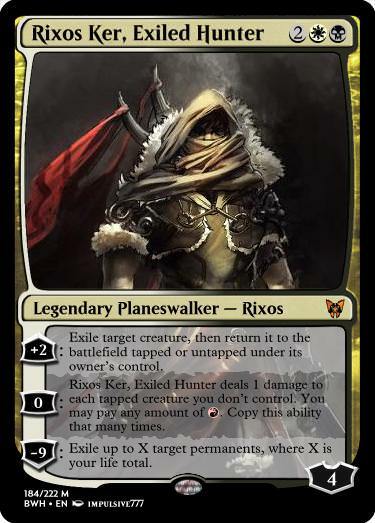 His new ptron, that man called Rixos, wasn't a true hunter. He saw it in his moves, in his smell in his everything. He was scaring every possible prey. But one thing Doer had to recognize him. He was strong. Not every one could say he had hunted an Anjanath. 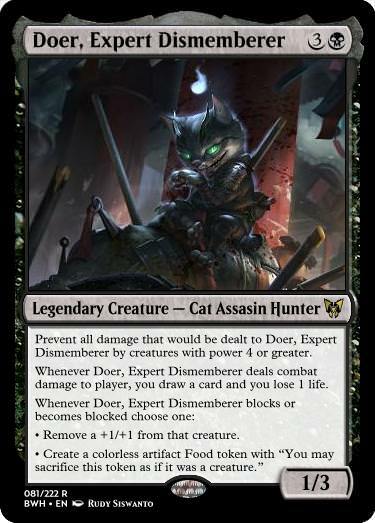 Of course he had, but he was the Expert Dismemberer. 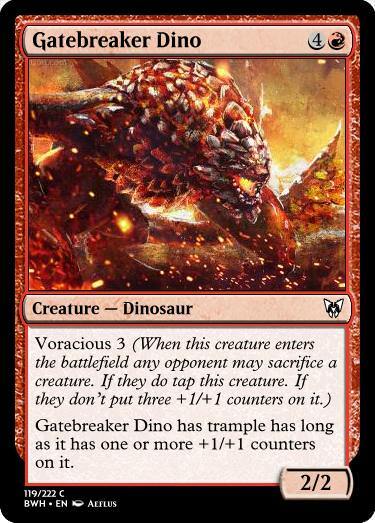 He had killed almost every non-Elder Drgon monter. Well, maybe whithout the almost. He could see Rxios trying to stalk their new prey. The poor man seemed clueless. He aproached him, with intention of elightening him with his vast knowledge of everything. -How the hell can I scare a six metre monster? -asked him. -And more important. Where is my team? I don't want to keep paying you for nothing. -Keep calm, meowster, your team is in the way. 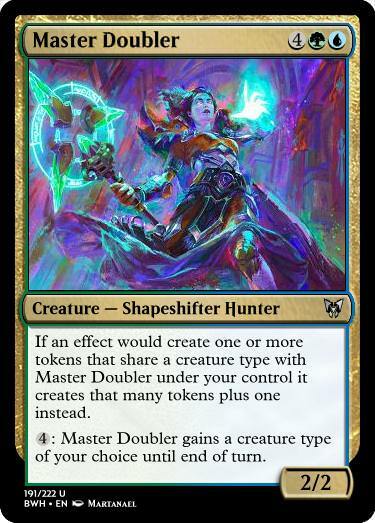 You know, getting planeswalkers together is not an easy task. -I'm still wondering how do you know about the existence of the spark. 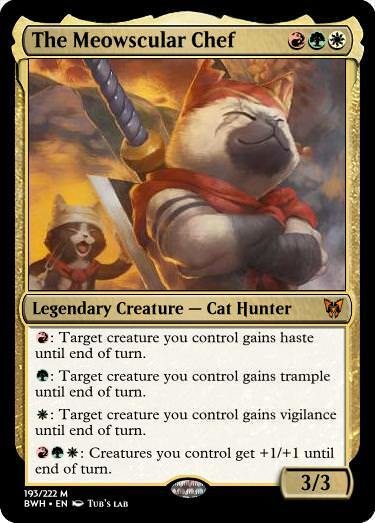 -Are you sure I'm not a planeswalker myself, meowster? -I do. I can see the sparks in people. Doer thought about something intelligent to say, but Rixos' expression had changed, so he let it pass. The human inmersed himself in a thoughtful silence, so Doer unfolded his katana and smelled the air. -I can feel it, meowster. The monster is near. 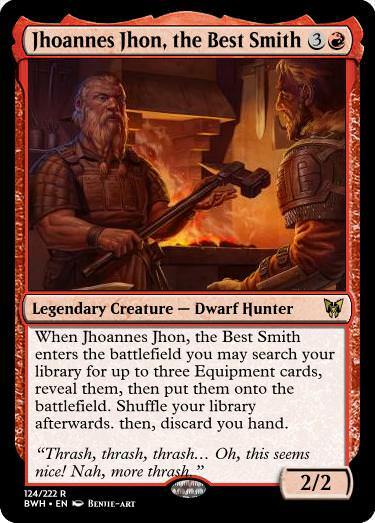 Jhoannes Jhon threw a hammer at the cat as soon as he stepped in his forge. -Doer you...! How do you dare entering my forge again? What do you want to steal now? -Keep calm, old meown, this time I've got money. This new contract is being super-jucy for me! -Not for my pocket...-murmured the man. Jhon Jhon had never seen him before. Tall, whit brown hair, quite handsome indeed. Sure he would be popular among young woman. Well, too among old dwarves. -What do you want, my lord? -I'm want you to forge the best weapon you have ever made. -replied the man. 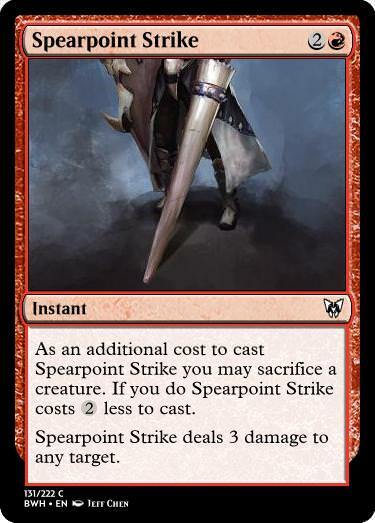 -So, you are asking me to forge the best weapon that has ever existed? You will need to bring me some truly hard to find materials. -I know, here you go, Fieldcrasher's bones. 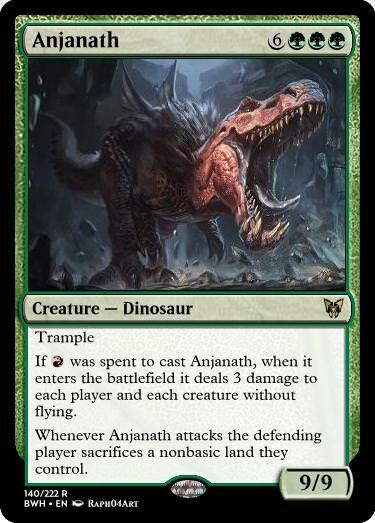 With an Anjanath vesicle. Jhon Jhon stood quiet. That was even better than the young hunter. A promising job. -What else will you bring? -Asked the dwarf. -The soul of an Elder Dragon. Grace climed to the tree. 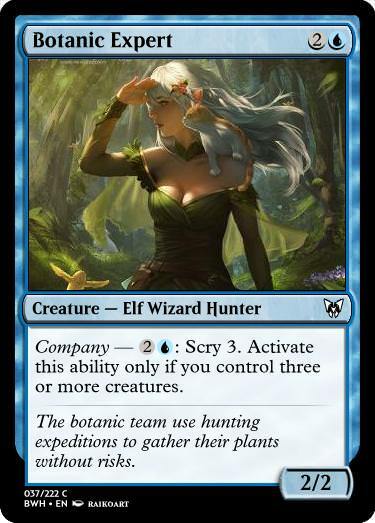 From where she was, she could see the warden of the forest sleeping. Her companon in that expedition, an young elven woman called Stena was whisteling carelessly behind her. -Whaaaaat??? -Stena overreacted at her words, jumping where she was. -Where is him? I want to seeeeeeeee!!!!! Grace shook her head. How had that woman found her way in life whit hat attitude? The young woman ran to the titan. The old spirit opened an eye, looked at her and returned to sleep. 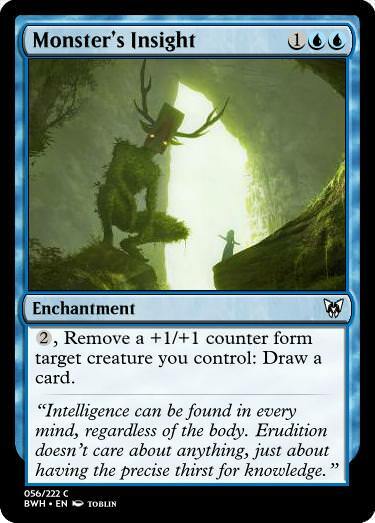 -Oh, great old ancient, I bow to your eternal knowledge! -Shouted Stena as she bowed before the treefolk. -You don't need to act like that -said Grace, putting a hand in her shoulder. -Just ask him. -Oh alright. So, I will ask. Should I trust the man called Rixos Ker? The giant opened his eye again. -You can do it. Trust him but don't love him. The last one didn't end well. Stena looked at him, but he stayed silent. -Hey Grace... Do you know where can I find a cat named Doer? 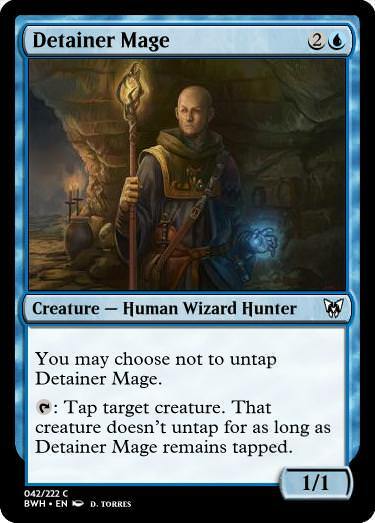 White and blue have a pretty decent amoung of tapped creatures hate. 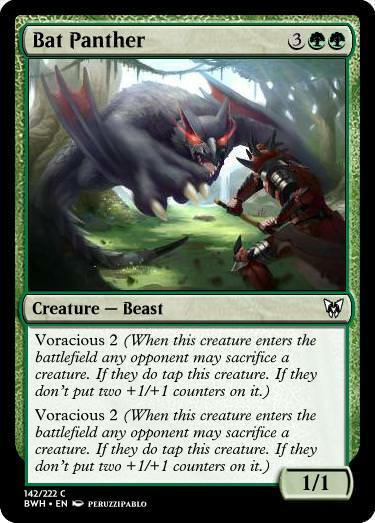 I'm not sure if this works, could the second ability be resolved before Voracious? And, if so, how could it be fixed? Promises are promises: #1 of things to expect. -After a little playtest food tokens are working far better than I expected. -Meowscular Chef is an actual character from Monster Hunter World, but I supose I can call it The Meowscular Chef. -Doer will never stop, NEVER!!!! -Feels better this way to me. -I might upgrade its rarity after limited playtest. -I'm currently working on typos, but thx for the offering. and #5 or things to expect. I will probably make a Set Hub one of these days with more projects, so, I think I will upload the story thre, or with a more balanced and playtested set file. 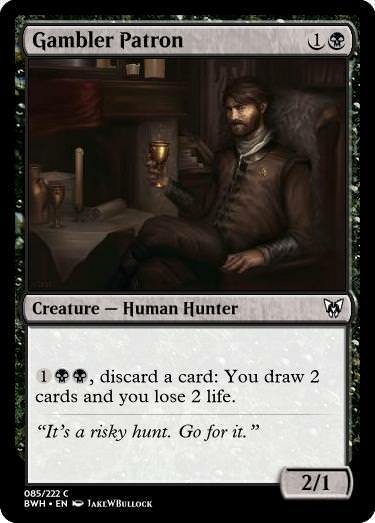 Until then, no fear and good hunt! 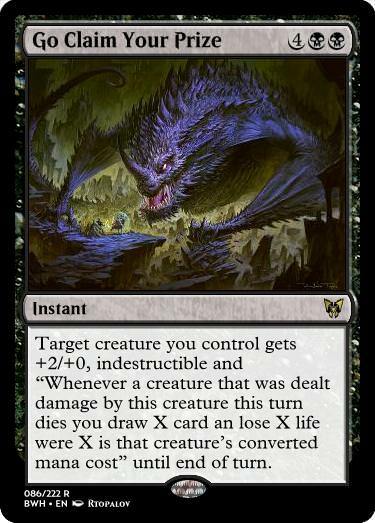 - Decree of Prevention, Fenec Infiltrator, Stone Colossus, Empowered Position, Evercoming Monster, High Flying Drake, Monster's Insight, Eat Carrion, Rampaging Ogre, Soul Drinker: who's talking? 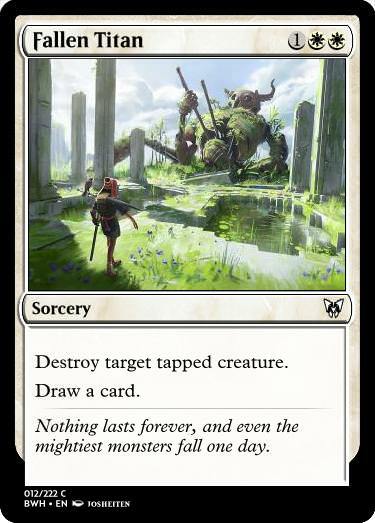 - Endless Sleep asks players to remember fair bits of stuff across their turns, which is usually frowned upon in MTG design. 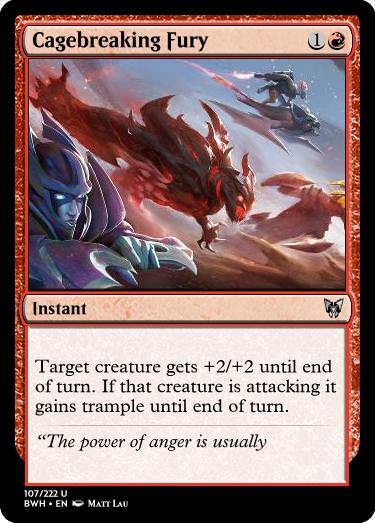 - Watch the Gate uses two X's in a way that doesn't work, the second one should be "Whenever a player casts a spell with converted mana cost less than or equal to the number of charge counters on Watch the Gate, counter that spell." - any reason why Atax' Pact isn't just a sorcery? - is Chamanic Rite's "they lose 6 life instead" meant to replace your lifegain? make you gain 6 life instead of 3? - Tough Learning: Is the sacrifice supposed to prevent the whole effect, or just the life loss? 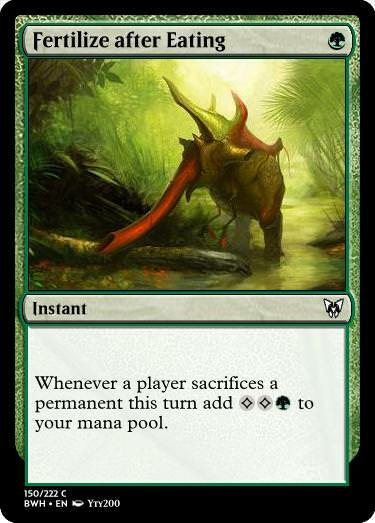 - Inspired Hunt: an instant that does nothing on cast unless you fulfil the pseudo feels bad as a design. maybe have a smaller base buff and a bigger one if there's Company? - is Lightning Warrior deliberately excluding walkers? 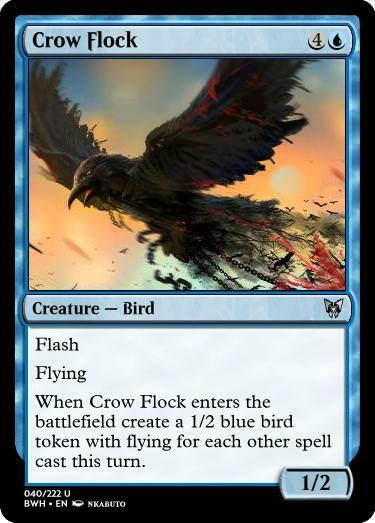 - is Lord of the Skies meant to do the 3 damage only once or for each other flying creature? - Preparing Lunch is another of those feel-bad commons to me, and also quite weak. 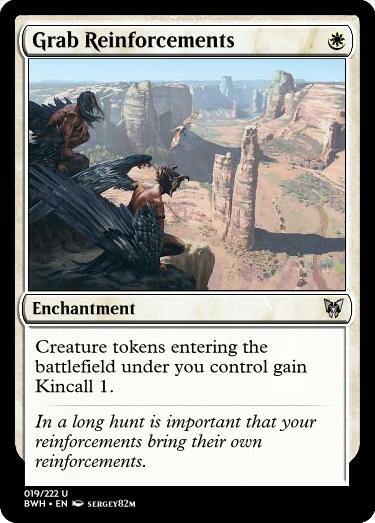 creating a token that I can do nothing with unless I play a sac engine, and in narrow circumstances, it also cantrips. this is weak.